Colvin & Moggridge » Art and Nature: an idyllic marriage. Great landscape design includes an appreciation and understanding of landscape as a setting for art. At its best, such design allows art and nature to work together: they seamlessly fuse, each perfectly complimenting the other. The placement of outdoor sculpture gives meaning to frameworks, axes and sightlines. It creates focal points, or punctuates – giving pause and emphasis to other elements in the landscape. 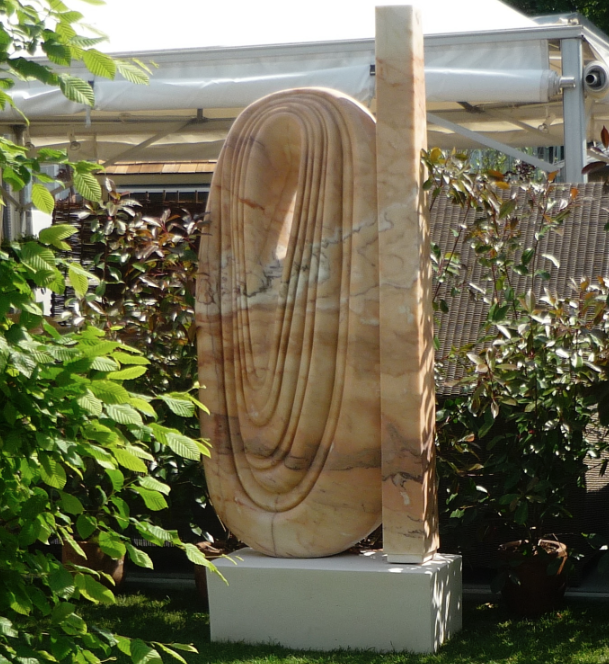 Many of our clients hold art in situ in existing landscapes, settings that we have improved to benefit the individual pieces or composite works, but outdoor sculpture is frequently sought by clients who wish to choose and place new pieces of art and garden ornament. Naturally we follow the auction sales and commercial collections held by long-established experts such as Summers Place/Sotheby’s and Architectural Heritage, but we also like to keep up to date with new works by contemporary artists. Noteworthy finds this summer have ranged from the exquisitely carved sculptures in Italian and Portuguese marbles, and Iranian onyx exhibited by Paul Vanstone at Chelsea in May…to the multitude of exciting works viewed during the practice visit to Fresh Air 2011 at Quenington in Gloucestershire. This year Fresh Air showcased outdoor sculpture by over 100 artists working in a myriad of materials, from metal to cloth. We’ll be posting images of our favourite outdoor sculptures as we find them. Sign up to receive our latest news.